Issho Ni Nene uses womb sounds and external music heard from within to soothe babies. Gadgets designed specifically for babies are never going to be exactly cool but TakaraTomy 's latest early-days gizmo proves that they can be as cutting edge as anything for the grown ups. 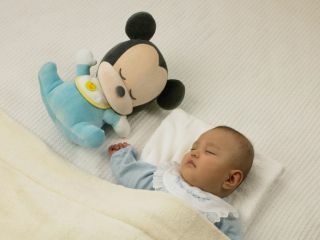 The ¥5,229 (£23) Issho Ni Nenne (Bedtime Together) is a soft toy that features a digital audio player for lulling cantankerous babies to sleep. It does this by playing a combination of music and recorded body sounds to create the illusion of returning to the womb. The womb sounds were recorded using a tiny internal microphone while music was playing outside. The result is a unique combination of sloshing fluids, heartbeats and music filtering in through the mother's belly, which is claimed to soothe a baby to sleep. TakaraTomy's other products in the series include Akachan Kerotto Switch (Baby Mood Switch), a toy that emits an audio 'curiosity trigger' that was scientifically developed to instantly distract a crying child to make it forget whatever the problem was. The switch was apparently designed by a laboratory that helps the FBI with audio detective work in criminal cases, so we're willing to bet that there's some pretty sound science behind the seeming magic.